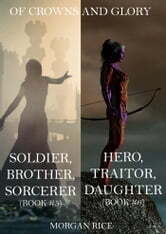 A bundle of books 5 and 6 in Morgan Rice’s new #1 Bestselling epic fantasy series OF CROWNS AND GLORY (SOLDIER, BROTHER, SORCERER and HERO, TRAITOR, DAUGHTER). Here are two bestselling novels, all in one convenient file. Over 120,000 words of reading, all for an incredible price—it also makes the perfect gift! 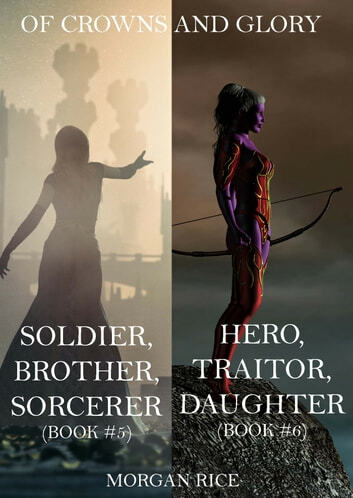 In SOLDIER, BROTHER, SORCERER (Book #5), Ceres has won the battle for Delos—and yet a complete victory still awaits her. As the rebellion looks to her as their new leader, Ceres must find a way to topple the Empire’s royalty, and to defend Delos from the pending attack from a greater army than she has ever known. She must try to free Thanos before his execution, and help him clear his name in the murder of his father. Thanos himself is determined to hunt down Lucious across the sea, to avenge his father’s murder, and to kill his brother before he can return with an army to Delos’ shores. It will be a treacherous journey into hostile lands, one, he knows, that will result in his own death. But he is determined to sacrifice for his country. Yet all may not go as planned. Stephania travels to a distant land to find the sorcerer who can, once and for all, put a stop Ceres’ powers. She is determined to enact a treachery that will kill Ceres, and instill herself—and her unborn child—as ruler of the Empire.